Surgi-Cream Extra Gentle for Face is a quick, effective and gentle way to remove facial hair from upper lip, cheeks and chin. Product works in as little as 4 minutes. Extra gentle formula now features Maple Honey, known for helping skin retain moisture. 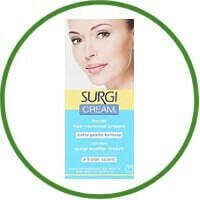 With Surgi-Cream, the hair removal, process is even more kind and gentle on the delicate skin of your face.